Newspaper: The SGX Scoop Newspaper Series! 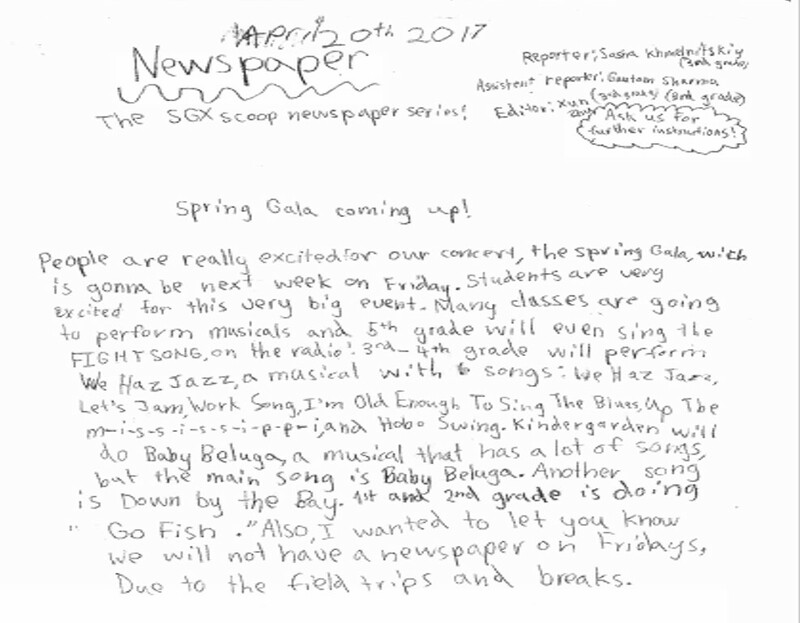 People are really excited for our concert, the Spring Gala, which is going to be on Friday, April 28. Students are very excited for this very big event. Many classes are going to perform musicals and 5th grade will even sing the FIGHT song from the radio! Grades 3-4 will perform “We Haz Jazz,” a musical with 6 songs: “We Haz Jazz,” “Let’s Jam,” “Work Song,” “I’m Old Enough to Sing the Blues,” “Up the M-I-S-S-I-S-S-I-P-P-I,” and “Hobo Swing.” Kindergarten will perform “Baby Beluga,” a musical that has a lot of songs, but the main song is called “Baby Beluga.” Another song that they will sing is “Down by the Bay.” Grades 1-2 is performing “Go Fish.” Also, we wanted to let you know that we will not have a newspaper on Friday due to the field trip.